Entry Fee: Submission fees for Digital/Analog Photography and Mobile Photography categories: £10 (1 image); £20 (2-4 images); £30 (5-8 images). Portfolio Project category £40 for a minimum of 5 and maximum of 10 images. ‘On a journey’ is the theme for the PHOTO HOUSE 2017. Once in a lifetime, we have all embarked on a journey, an exotic trip or holiday. An adventurous expedition, as a necessity, a means of escape or the only way out. There is also our daily commute alone, in a car, or on a crowded train. Travelling is the dimension of movement triggered by the unstoppable search for something new, or unusual. It also represents self-exploration of our inner thoughts and hopes, which may be faced with both excitement and fear. Photographers are invited to capture the emotions which go beyond the immediate experience of travelling, to include the diverse worlds which conflict and coexist simultaneously in modern life. All visual interpretations of these concepts are welcomed. Documentary and conceptual, as well as storytelling and abstract. The Competition is curated by Lichena Bertinato and organised by the Board. Images will be selected by the Judging Panel. 15 artists will be selected to be part of the Photo House Collective Exhibition at Le Dame Art Gallery. 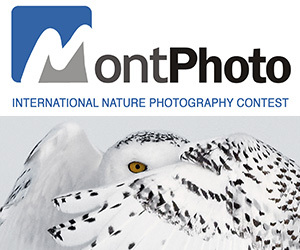 Digital and Analog Photography Category – A single image category. Colour or B&W images welcomed. Unlimited number of entries allowed. Mobile Photography Category – A single image category. Unlimited number of entries allowed. Portfolio Project Category – A series of 5 -10 photographs from the same project. Entries should all be received by 5th September 2017 at 11:59 pm (Greenwich local time GMT+0). Black and White photos are allowed in all categories. 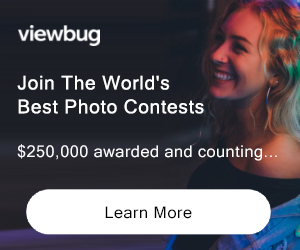 Entries for the Digital/Analog Photography and Portfolio Project categories must be in high resolution JPEG files, with a maximum of 2 MB in size (the minimum of the longest side being no less than 2000 pixel; the quality no less than 300dpi). In the Mobile Photography category only photo(s) from smartphones or tablets are permitted and all entries must be JPEG file with no limitation in size. In the Portfolio Project category, participants can submit a series of 5-10 photographs from the same project. Submission fees for Digital/Analog Photography and Mobile Photography categories: £10 (1 image); £20 (2-4 images); £30 (5-8 images). Portfolio Project category £40 for a minimum of 5 and maximum of 10 images. Shortlisted images and winners will be announced on 15th September, 2017. £ 500 cash plus one year representation contract with Le Dame Art Gallery, 1 image to be included Photo House Collective Exhibition at Le Dame Art Gallery. The Overall Winner will be selected among all Categories. 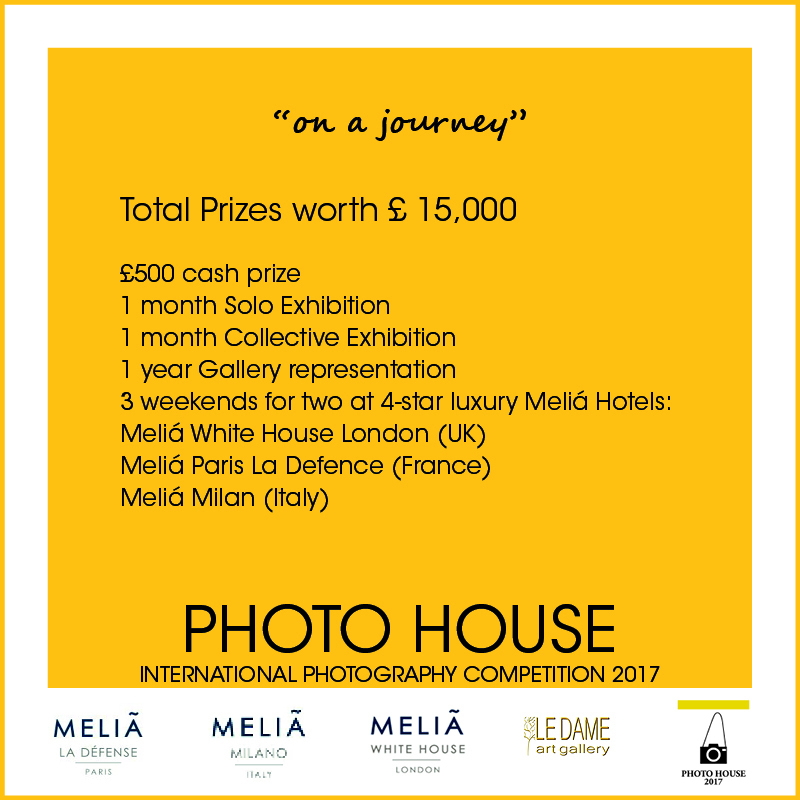 Digital and Analogue Photography: First Prize*: a weekend for two in London at the 4-star deluxe Hotel Meliá White House near Regent’s Park and 1 image to be included in the Photo House Collective Exhibition at Le Dame Art Gallery in London. Mobile Photography Photography: First Prize: a weekend for two in Paris at the 4-star deluxe Hotel Meliá Paris La Defence and 1 image to be included in the Photo House Collective Exhibition at Le Dame Art Gallery in London. First Prize: a weekend for two in Milan at the 4-star deluxe Hotel Meliá Milano and a Solo Exhibition at the Trafalgar Exhibition Space in London’s Le Dame Art Gallery for one. Not eligible to enter? - Find contest where you are. 1. Submitted Photo(s) must be original material taken by the Entrant. The photographer must hold all moral, intellectual and copyright of the work submitted. 2. Photographers are responsible for obtaining permission to use the model and property releases for individuals or properties related to the submitted images. 3. Upon making Your Submission, You grant Le Dame Art Gallery, a perpetual, worldwide, non-exclusive, royalty free, sub-licensable right and license to use, publish, reproduce, display, perform, adapt, modify, create derivative works, distribute, have distributed, print, promote Your submitted Photo(s), in whole or in part, in any form, in all media forms now or hereafter known, anywhere in the world for any purpose, related to the Competition, the publication in Le Dame Art Gallery promotional digital and/or printed materials and formats broadcast such as on Le Dame Art Gallery magazines, printed leaflet and brochures, Le Dame Art Gallery website and/or through other public online feeds, promoting subsequent competitions and/or the work of Le Dame Art Gallery generally. USAGE RIGHTS: All the photographs selected for the exhibition, will be promoted and launched on to the art market in accordance with the Le Dame Art Galley agreement.